Nishi Enterprise is a proud manufacturer of top-grade crane wheel assemblies that can be used for a broad range of industrial applications. Our new crane wheel assemblies come with reconditioned features and they can be availed in a number of useful configurations. 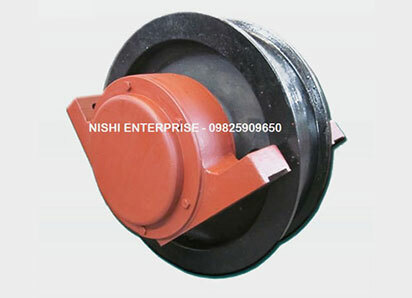 Whether you are looking for a crane wheel that is mounted perfectly on a shaft or a crane wheel assembly that is further equipped with couplings and gears, bearings and bearing housings, we at Nishi Enterprise can deliver the perfectly solutions for you. We have been manufacturing state of the art crane wheel assemblies for various clients and we can also deliver custom solutions for your business needs. If you are looking to enhance the design of the currently existing crane wheel assemblies that you have right now, you can use our help and products to improve the design, material as well as the heat treatment of these components, namely shaft, wheel, gear, coupling and bearing housings. This is something that you must do if the specific application that you are undertaking is susceptible to premature failures. Additionally, you can also use our crane wheel assembly components for replacing the original equipments and assemblies without changing the existing equipments. We always make sure that the crane wheel assemblies that we offer are equipped with embedded metallurgical properties which guarantee a prolonged service life. Here is a brief look at the benefits offered by our custom crane wheel assemblies. The crane wheel assemblies that we can offer you with are perfectly designed for replacing the OEM assemblies without making any modifications to the currently existing equipments. We can also provide you with contour hardened track and crane wheels that can deliver the most uniform contour hardness for the inner flange and tread wear surfaces and maintain a ductile core for resisting shock loads. Our crane wheel assemblies can be used to address various issues with the vintage, 2-piece pinion gears on the shafts which mean that they can combat unseen cumulative stresses which can potentially cause serious and catastrophic failures. Each of the products is manufactured in strict factory-controlled conditions so as to make sure that they deliver longer wheel lifespan.